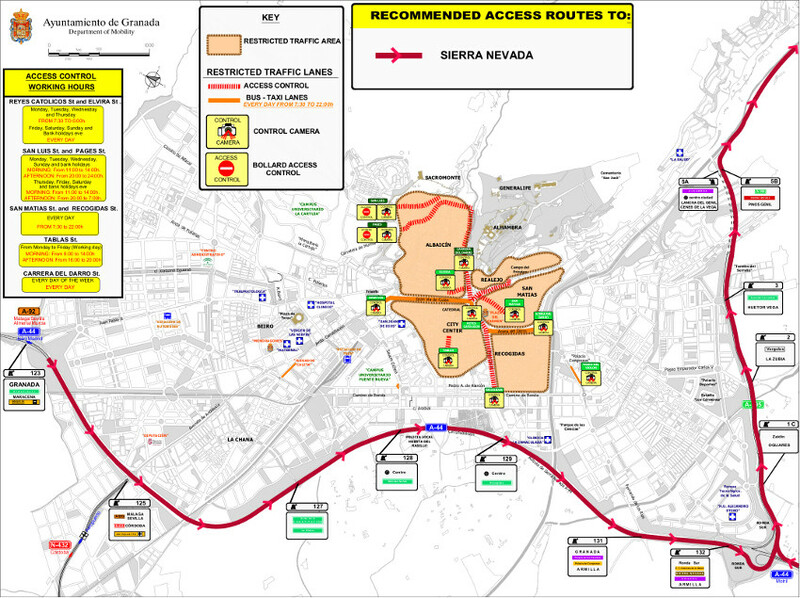 Access routes to Sierra Nevada ski resort by car. Sierra Nevada Ski Resort its 31 km away from Granada city. In the following map you will find the recommended itinerary to Sierra Nevada. You don´t need to entry to Granada city to get to Sierra Nevada. The itinerary will be from A44 (motorway Bailén - Motril) get to A-395 (Ronda Sur). Continue along the motorway to the Serrallo tunnels, where you should follow the indications to Sierra Nevada, following the A-395 wich now became to a mountain road. If you are inside the city with your private car, go to the closer motorway access, so it will be the easier way to get to the Ski Resort. From the Granada Bus Station departs several buses to the Ski Resort. Check timetables and more info at ALSA homepage. During the ski season journeys between Ski Resort and Bus Station are reinforced. The rest of the year this journeys works but in a fewer frecuency. The journey will take 45 min. aproximately.